In a nutshell: Microsoft is on a mission to deliver value-for-money smartphones, and the Lumia 640 gives you everything you need, for just a little over �100 on PAYG. With a big HD screen, quadcore processor, 8 megapixel camera, 4G connectivity and a large battery, there's nothing missing from our list of must-have features. 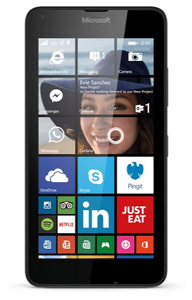 The Microsoft Lumia 640 looks very much like the Lumia 535. It's quite chunky for a mid-range phone, but that's because it has such a large screen. At 5 inches, this screen is as big as the latest flagship Android smartphones that cost 4 or 5 times as much. The phone can't be described as superslim, but at just 8.8mm thick, it's slimmer than most phones in the budget or mid range. It's a relatively heavy phone though, so take this into account when deciding whether to buy. The phone has typical Lumia styling - plastic, yet smart and durable - and is available in a choice of colours, including Black, White, Blue and Orange. 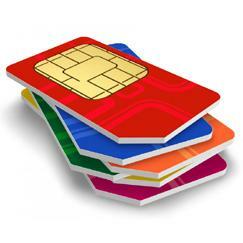 The coloured back covers are exchangeable. The screen isn't just bigger than average, it's also a HD screen with a high resolution of 720 x 1280 pixels and a 294ppi pixel density. That already puts it head and shoulders above many phones at this price. It's an IPS display with Microsoft's ClearBlack technology, making it bright and easily readable outdoors, as well as being sharp and with wide viewing angles. We'd say it's one of the best screens you can hope for in the mid-range. It's protected by scratch-resistant Gorilla Glass 3 too. Our first impressions of the Lumia 640 are good, and we also like the fact that it ships with Lumia Denim, the latest update for Windows Phone 8.1. This includes support for a 3-column home screen, which works well on the big display of the 640. The user interface incorporates some nice new features such as double-tap to wake, and a glance screen. You get a lot of free apps with Windows Phone 8.1, including Office 365, Facebook, Twitter, WhatsApp, Skype and Internet Explorer 11, as well as the excellent HERE Maps and HERE Drive navigation system with offline maps available. You also get Cortana, Microsoft's virtual assistant, which can listen to voice commands or text, and respond in kind. The third-party app market for Windows Phone is steadily improving, with more than 375,000 apps now in Windows Phone Store. The Lumia 640 uses a quad-core Snapdragon 400 processor with a clock speed of 1.2GHz. It's typical for a mid-range phone and is "right" for the phone. That means that normal activities such as the user interface, running standard apps and watching video will run smoothly, but it's not the best phone if you intend to download the latest high-end games. The memory is "right" too - 8GB onboard, with 1GB of RAM, and a memory card slot that will accept cards up to 128GB. OneDrive also gives you up to 30GB of free cloud storage. The main rear-facing camera is a high resolution 8 megapixel camera with 4x digital zoom, autofocus and flash. The camera has good low-light performance, aided by a 1/4 inch BSI sensor, wide f/2.2 aperture, and a dynamic LED flash. The camera can record video at full HD 1080p resolution. The front camera has a lower resolution than many - at just 0.9 megapixels. However, this is sufficient for selfie shots, and the camera is able to record 720p HD video, with support for video calling. 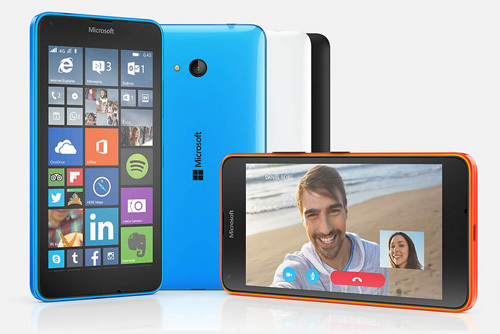 The Lumia 640 is the first phone from Microsoft to support 4G. 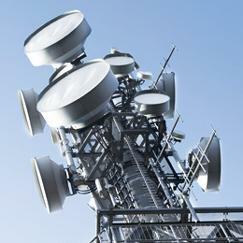 It also supports 3G and 2G networks. Other connectivity options include Wi-Fi, Bluetooth 4.0, micro-USB 2.0, NFC and a 3.5mm audio jack. DLNA and screen mirroring are also available. A-GPS, A-GLONASS and BeiDou positioning services are all supported. The Lumia 640 has a large 2500mAh battery. This is as powerful as any battery in the budget or mid-range sectors, and is capable of delivering up to 8.6 hours of continuous video playback. It makes the phone one of the longest lasting smartphones you'll find, unless you spend significantly more. The Lumia 640 is a step up from the budget Lumia 435 and Lumia 535. 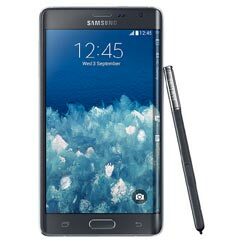 Yet at just over £100 on PAYG it can hardly be described as an expensive phone. For the money, you get a great deal. How do I transfer my contacts from my old android phone and how do I install google chrome? I have just taken delivery of my new Microsoft Lumia 640 phone but am having difficulty with transferring my contacts to it. My old phone has no SD card and its SIM is too large to fit the new phone. I'll separate my review in to two parts. The device and the OS. I'm pleasantly surprised with the device. By no means is it meant to be a flagship device, but instead a device that runs the OS well with little to no bugs at all. This is a big thing for me. I've had Android and iOS phones, but all have had bugs and glitches which made the device a chore to own and use. Gone are the days of the Nokia classic phones (gone is Nokia phones). After my last return to an iOS phone I knew it would be the last time I own one. Its great to have the latest and greatest phone and OS, but do phones need the specs a PC has. No. The Lumia 640 is low/mid spec and runs WP8.1 really well. It does all the basic without a glitch. I don't use a phone for games. The screen (even if it was a phablet) are to small for games IMHO. I have a PC and a PS3 for gaming. Build quality can't match the iphone or latest Galaxy S6, but its not meant to. If the rear casing was aluminium you would know the phone only cost (mine) �120. I cant fault the hardware. The OS. Being as I was an iphone user since the first I've spent a lot of money on apples ecosystem. All but the music purchased is restricted to apple devices. Android is less restrictive as you have lots of makes and models to choose from. Windows Phone is similar to iOS but you don't need devices like the apple tv to stream content to a tv. The Lumia 640 uses miracast (like android) but I've found this to be very reliable on the Lumia 640 compared to similar priced androids. I think Windows Phones have a lot to offer. With windows 10 for phones release date around the corner and the prospect of converting android and iOS apps to then be sideloaded makes it more a main player in the phone world. Bought this phone recently. I'm very impressed with it bearing in mind it only cost �160. Nice big sharp screen. Operating system is easy to use and free office for a year with extra storage on OneDrive is a bonus. Live Tiles are absolutely brilliant and are the way to go for other operating systems. Windows store is hopefully improving and the main apps I use are there already. No it's not an iPhone or Galaxy S6 but the phone offers great bang for your buck.